A page break is used to determine where the printed page ends and where begins the next one, so the content before the page break will be printed on one page and after the page break on another. You can preview how many pages will be printed by choosing Page Break Preview. You can find it in two places. VIEW >> Workbook Views >> Page Break Preview. Each page is enumerated, so you will know which part of the worksheet will be printed on which page. We can distinguish two types of page breaks. 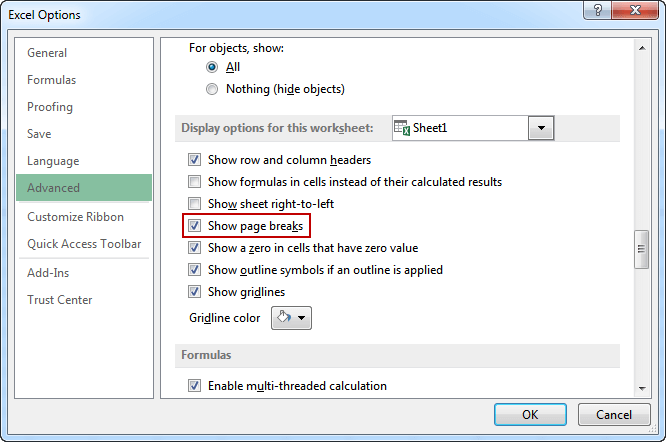 These page breaks are created automatically by Excel, so when you print your worksheet without changing their position these page breaks will be used. Automatic page breaks are specified by dashed lines. As you can see the automatic page break was inserted between column G and column H. This means that the table will be printed from cell A1 to G5 on the first page and from cell H1 to H5 on the second page. Dragging an automatic page break. It will change it to the manual page break. Manual page breaks use solid lines. In order to insert a new page break, go to PAGE LAYOUT >> Page Setup >> Breaks >> Insert Page Break. If you want to print names and first three months on the first page, and the next four months on the second, select cell E6 and click Insert Page Break. Vertical at the left edge of the active cell. Horizontal at the top edge. In our example, it will split the table into two parts. You can move both inserted and automatic page breaks. In our example, the automatic page breaks probably are not where you want them to be because you can easily fit the last column on the same page as the other ones. Change the view to Page Break View and move page break between column G and H one column to the left, so it will be between columns H and I. In order to remove a page break, first, choose Page Break Preview and then place your cursor in the cell that is adjacent to the page break from the left or top edge. Take a look at the following example. Now, go to PAGE LAYOUT >> Page Setup >> Breaks >> Remove Page Break. It will remove the vertical page break between columns C and D, and the horizontal page break between rows 3 and 4. You cannot delete automatic page breaks. If you find page breaks annoying you can hide them. Go to FILE >> Options >> Advanced and under the Display options for this worksheet uncheck Show page breaks. If you want to reset all the page breaks you inserted, go to PAGE LAYOUT >> Page Setup >> Breaks >> Reset All Page Breaks. All manually inserted page breaks will be removed and the automatic page breaks will appear as they were present at the beginning.